The tumble of breaking waves are summoned in an instant. Although miles from an ocean, I still hear their sound. Water rushes forth. The notes settle, music one can’t forget. Pounding, rushing, and rolling. Mesmerized, I entangle with a force stronger than any I know. Long ago, in those moments of nature and youth, we stood on a sandy beach. Under the light of the stars, we were bewitched by the moon. La Luna charmed us into believing that magic happens. 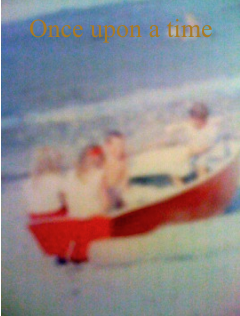 Through childish eyes, we imagined sailing away in an old salvaged boat. Mermaids frolicked in sea-foam while King Neptune navigated our voyage. We hummed the ocean’s lullaby as the wooden boat was gently rocked by waves. It was a beautiful moment in time. The sea’s melody plays round and round my head. Such is the glory of the ocean. Like an orchestra, the heavenly musicians mesmerized us. The haunting notes begin slowly, rise to a rumble. The push and pull gathers frenzied momentum, until finally crashing to the shore. Then the crescendo repeats. Driven by passion and power, the ocean sings for the moon. I remember. For several years of childhood, we’d vacation at a rustic resort on Vancouver Island. To our way of thinking, the winding roads to Kye Bay stretched forever. “Are we there yet?” Familiar words to parents of young children and we were no exception to the rule. It felt as if we passed too many bays from Oyster to Fanny until the car finally came to a full stop. Those were joyous moments. We had our father near. On the mainland there were always projects to complete, gardens to plant, and places to go. Life was a scramble. On the island he was ours. The pace slowed, the workload lessened, and time paused. It was more than enough. Kye Bay is still there, waiting for you to return. Love that song too! What a mellow and sensuous voice Lana Del Ray has. It sounds like a lovely place in the real, your memory, and your imagination.